While overshadowed by the national recognition of the San Juan and Canadian Gulf Islands, south Puget Sound is a hidden gem right in our back yard. Best of all, for those in the under 40’ boat crowd, the south Puget Sound marine weather provides more visiting opportunities than you might expect. Winter, spring, summer or fall, south Puget Sound is a rich cruising ground. Few have attained the expertise of Quartermaster Yacht Club life member Frank Zellerhoff in exploring this area. Join us to learn about that special get-away spot, avoid the hazards on the way while maximizing use of your Quartermaster Yacht Club reciprocal privileges! 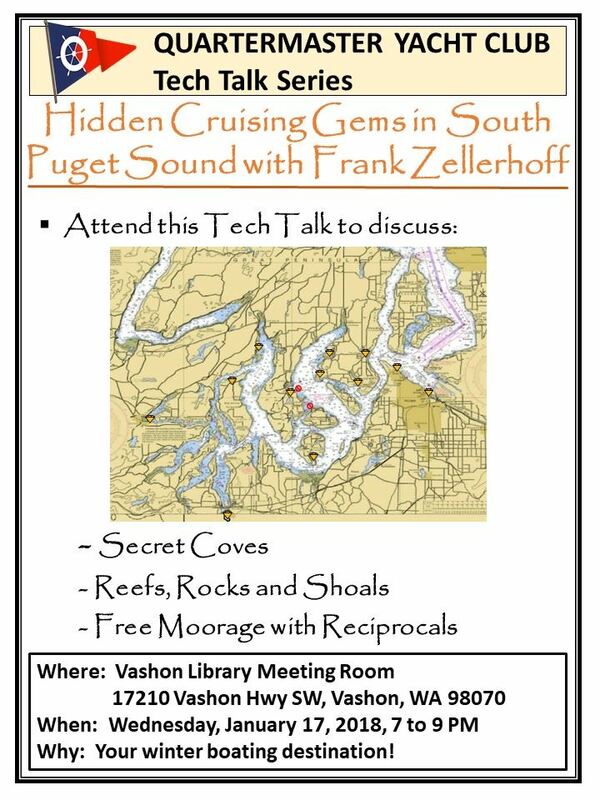 Bring your own south Puget Sound hideaways to share at this Tech Talk hosted by Kevin Jones and Frank Zellerhoff on Wednesday, January 17 at 7PM in the Vashon Library meeting room.